Take the race wherever you go with the Pocket Raceway! Ready, set, place your cars on their starting marks, pull back the launcher, and send your vehicles jumping straight through the awesome obstacles! When the race reaches its finish, fold it up, put it in a pocket and go! Includes 2x pieces of orange track and 1x Hot Wheels vehicle. This set is easy to store and offers super portability for a great price! Connect to other Hot Wheels tracks (sold separately) to build the world of play. Ages 4 and up. 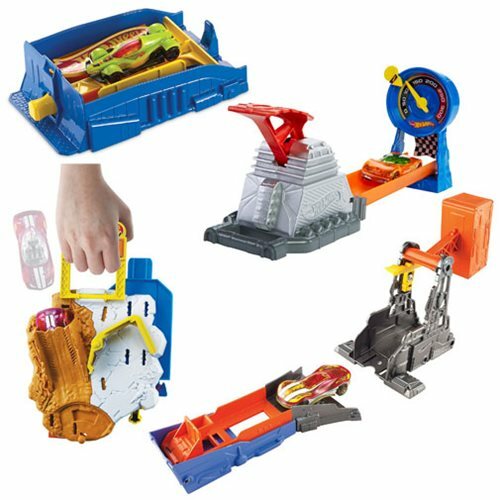 The Hot Wheels Pocket Raceway Playset Case includes 4 individually packaged playsets.